Le film a demandé à ce gars, Casey Neistat, s'il était intéressé à faire une promo pour le film de Walter Mitty. Le film lui a donné un budget de $25.000. Ils voulaient transmettre l'émotion de prendre des risques et faire vos rêves pour inspirer les autres à faire de même. 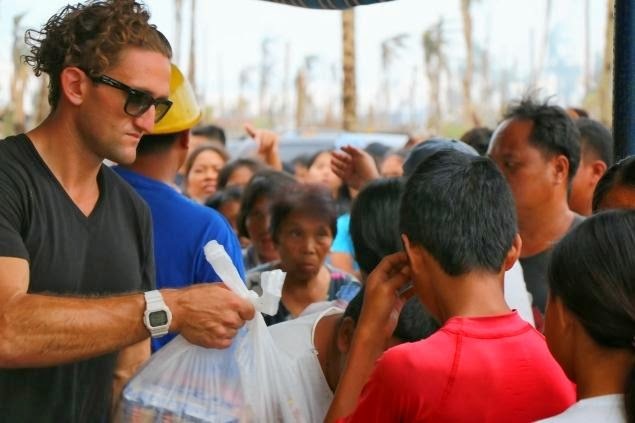 Casey leur a dit qu'il voulait utiliser l'argent pour aider à Typhoon Haiyan aux Philippines...et ils ont dit, d'accord! This makes me want to see the Walter Mitty movie with Ben Stiller. The movie asked this guy, Casey Neistat, if he was interested in making a promo for the film and gave him a budget of $25,000. They wanted to convey the emotion of taking risks and making your dreams come true to inspire others to do the same. Casey told them that he wanted to use the money to help with Typhoon Haiyan in the Philippines...and they said, OKAY! I was like, hmmm the name Casey Neistat sounds familiar...and then as I pressed "play," I realized that he's the same guy who made that viral video back in 2011 about getting a ticket for riding his bike NOT in the bike lane (which is not illegal, btw). Anyway, what the Walter Mitty + Casey and company ended up doing with the budget for a movie promo is exactly what the movie seems to be about, and I dig those principles. Seeing marketing money spent this way to help others makes me want to watch the movie and give them my money and time...and that kind of marketing strategy really was the best kind of marketing they could have done.